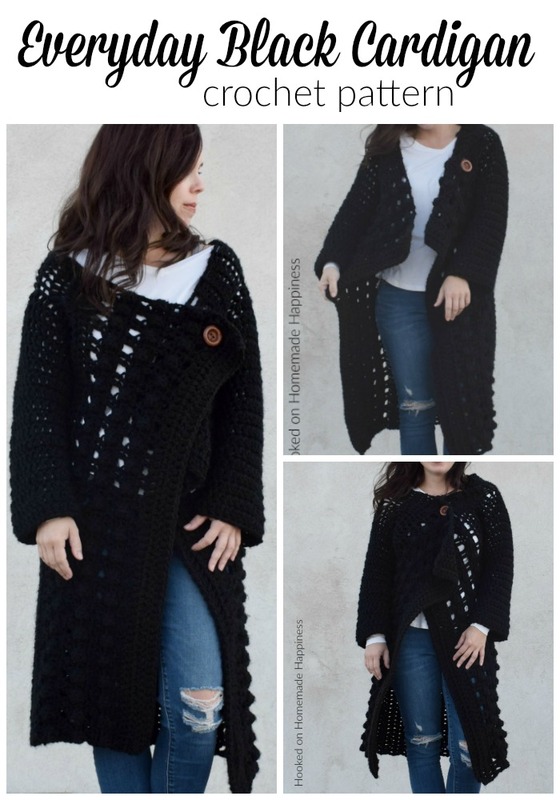 I’m so excited to share with you this Everyday Black Crochet Cardigan Pattern! Who doesn’t need a black sweater. right? It’s easy to grab and match with pretty much any outfit. You won’t believe how easy this cardigan is to make. It’s simply a rectangle, with armholes and sleeves added! There is a little bit of detail on the ends of the cardigan, but not much. It’s a simple pattern with easy stitches. Easy! And it’s so warm and cozy, it’s like wearing a robe for the day. WIN! – Get the free pattern below or this pattern is available as an inexpensive, clearly formatted, PDF instant download in my Etsy Shop or Ravelry Shop! Sew on your button about row 16 about the 6th dc from the top. 7 skeins for what size? Will 7 skeins be ok for S- XL? Is this made using chunky yarn? 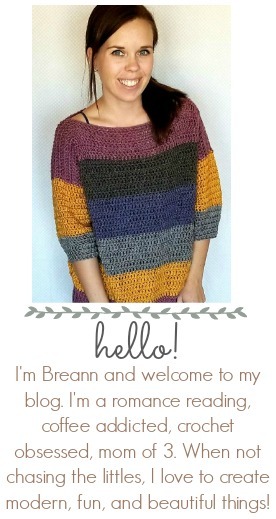 Love all your patterns I’m want to make a poncho with a cuff I’m new to crochet but know all basic stitches. I’m tall can you suggest a pattern please. details? This pattern is great. Thank u so much for sharing! I love it!! 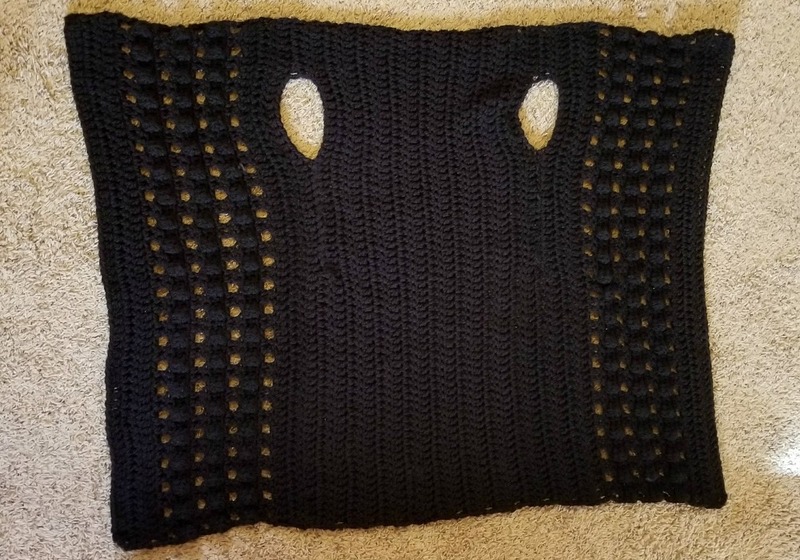 I really like it in the blk yarn you chose. Was it expensive to make? Cl means cluster stitch? How did u make your cluster stitch? There is no ch 1 in row 53. It’s dc in the stitches and ch 1 spaces from the previous row. 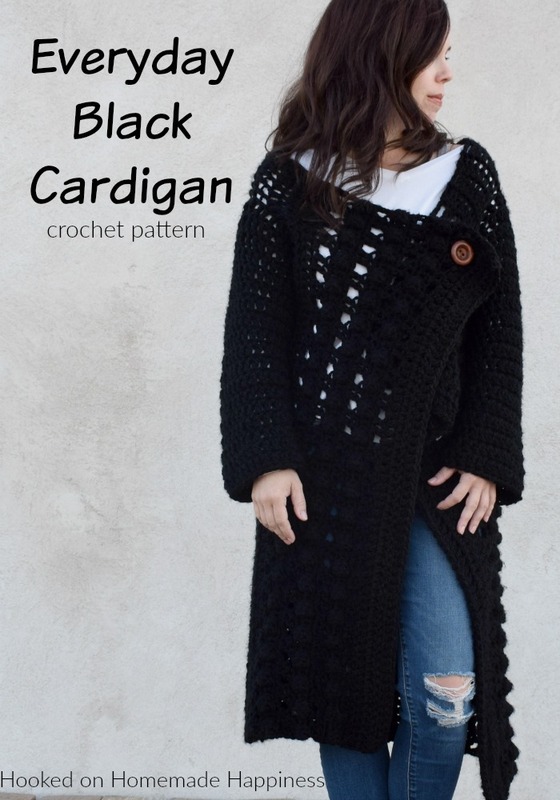 Would you do a video tutorial for Every Day Black Cardigan pattern? Thank you! No, the sweater would turn out much smaller with that weight yarn and size hook. Hi …. love the pattern already started on it , I’m using the charisma yarn in off white . Will Any number 5 bulky yarn work ? I’m confused on the cluster. Yarn over, insert hook into stitch, pull up a loop, yarn over- it says pull thru 2 loops but I end up with 3 loops. What am I doing wrong? can you please confirm how big the skeins are?